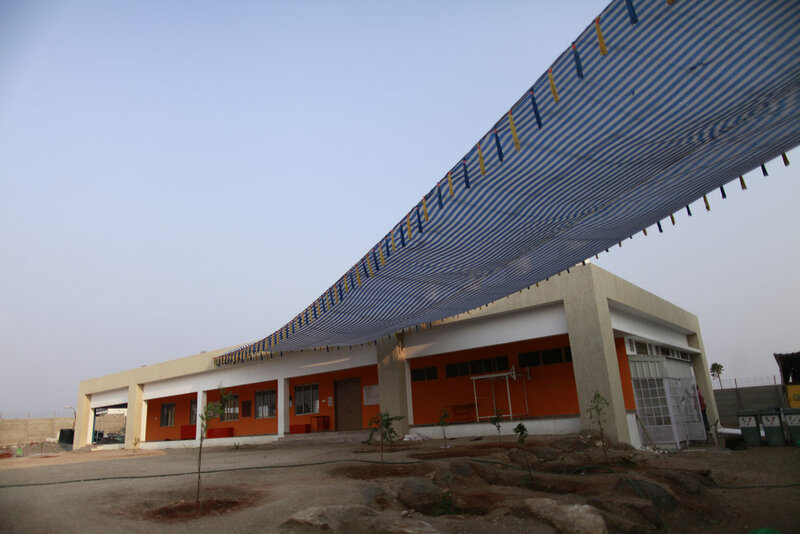 PA System worked for three months in Chettipalyam, India to transform Global Pathways Higher Matriculation School with several murals, sculptural metal wall installations, artwork utilizing natural light, collaborations on playground and landscaping, and mosaic floors and pots with the participation of local businesses, students and their families. Below: Beginning a Kolam, installed in the GPMS Courtyard. A Kolam is a line drawing made around a grid of dots. It is a Hindu practice performed every morning, traditionally by female family members at the entrance of a home. Ritualistic, structured, and part of a collective effort, the dots are a jumping off point for expression that opens the household to the opportunities of every day. PA System collaborated with 9th Standard students on a ceiling mural for the karate and dance corridor. The students created paper-cuts of locally inspired imagery with material to create a resist. On the courtyard walls opposite the mural metal sculptures were installed that were bent and welded at a local shop down the road. The sculptures spell out the Tamil word “nandri",” meaning “thank you” or “gratefulness,” which repeats in a semi-circle on the walls. Over the course of the day the shadows change, overlap, and move across the space. A piece of mirror cut at a local glass shop reflects the sky and mural across the courtyard. 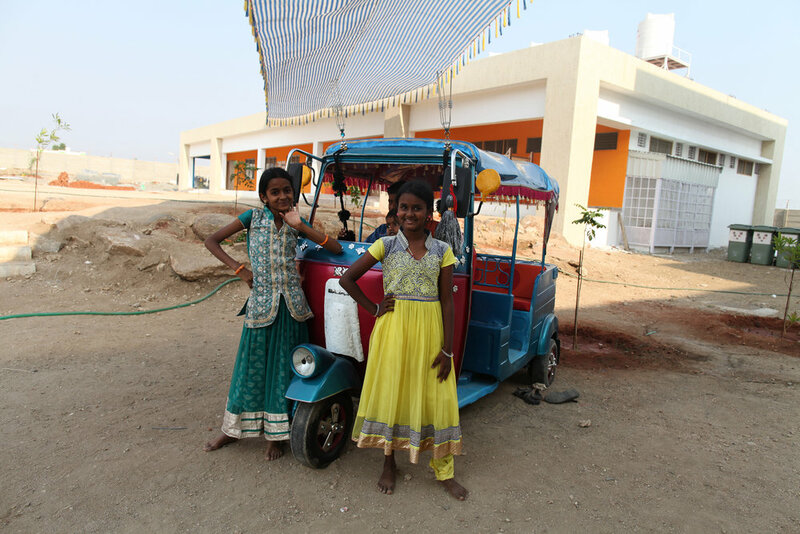 Below: collaboration on shade structure with Patrick Ellard and worked women in the community: Kanchana, Shara marry, Reetha, Meena, Boon crody, Sanshi, Muthammal, Selva marry, Shanthennr mari, Rathna. S, Mookkammah, Hasheena, Rathna M, Manju, Saranya, and Balaniyammah. 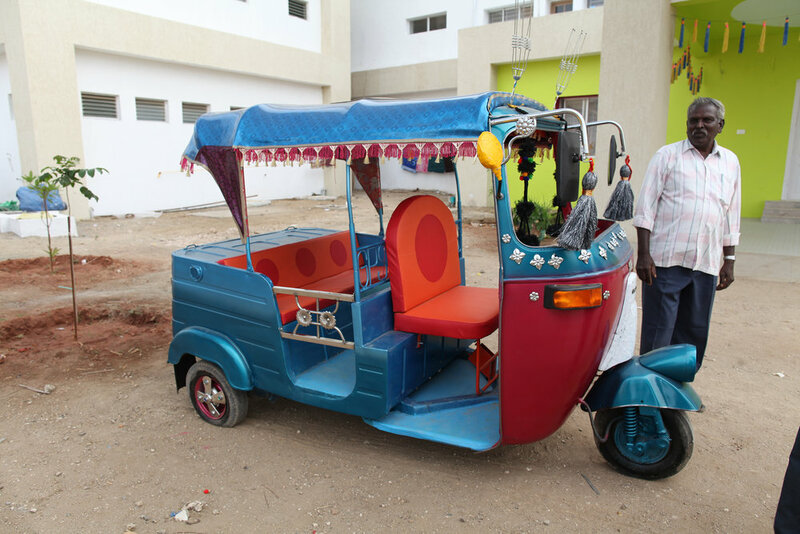 Working with Sadiq Basha and local fabricators, a play-auto was added to the school yard. 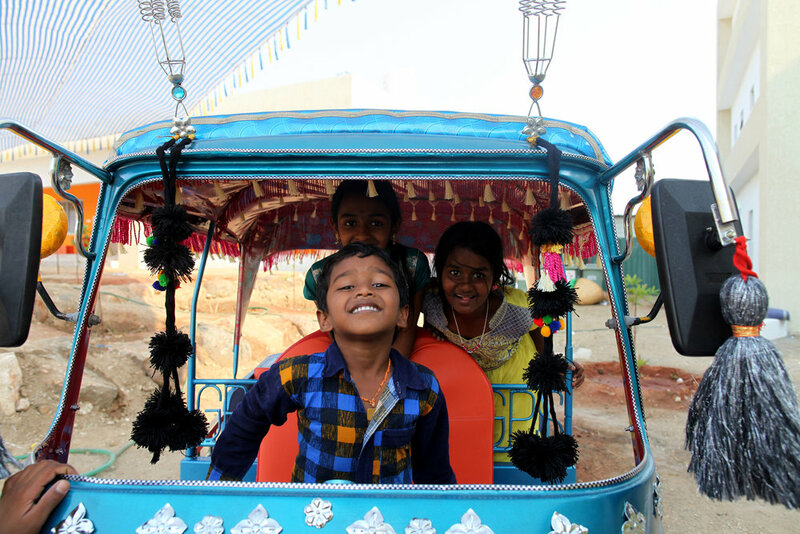 Autos are a common form of transportation that some GPMS parents drive for a living. As much as possible drivers will customize and decorate their vehicles. 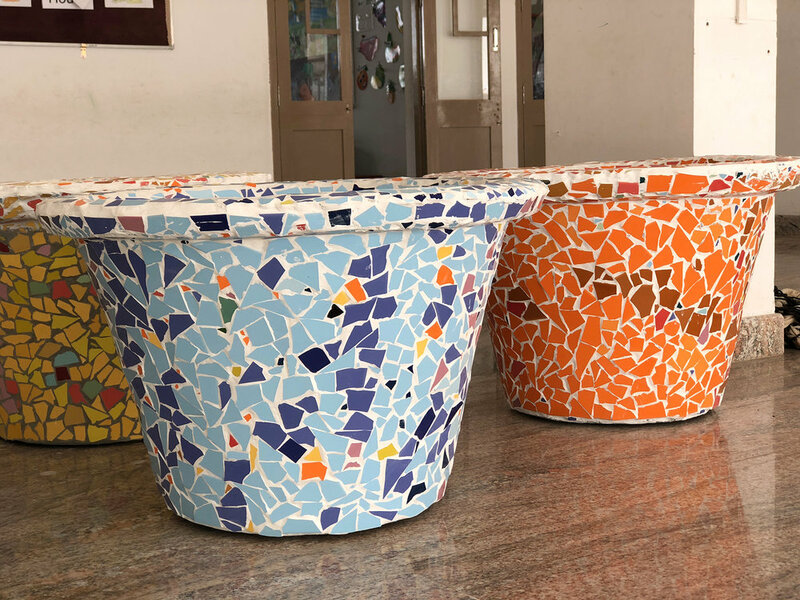 Mothers of the students led by Kanchana and Maju collaborated with PA System on several mosaic pots that brought greenery and colour into the school. This was a new skill for all involved, using “seconds” tiles from a local shop and led to further flower pot commissions for the women. Below: Local handmade tile workshop Veeya Tiles was engaged to produce custom-designed tiles and layouts for two recessed areas on the first floor of the school, that lead up to painted skylights with potted plants and sculptures. Community members were hired to install the tiles and do the mosaic skirting.